Is there any way to adjust the door gap on an F1 cab? Yes, with a big rubber hammer and a baseball bat! If you have a Shop Manual, the procedure is described starting on page 295 (unsupplimented). There are door adjustment spacers (shims)available at various aftermarket venders for this very application. They come in many widths (thickness). Place the appropriate ones through a trial and error method behind the upper and lower hinges. You can get a perfect gap all around your door, it just takes patience but can be done. Remember to put the spacer or spacers between the hinges and the door frame. It almost requires three hands. mervy my problem is the gap is too big at the bottom. The shims seem like they would work if the gap was too tight. Am I missing something? Are the hinge half in the door removable and adjustable. Thx for your help. Do you mean the gap btween the door and the rocker panel? the gap between cowl and door at the bottom hinge. 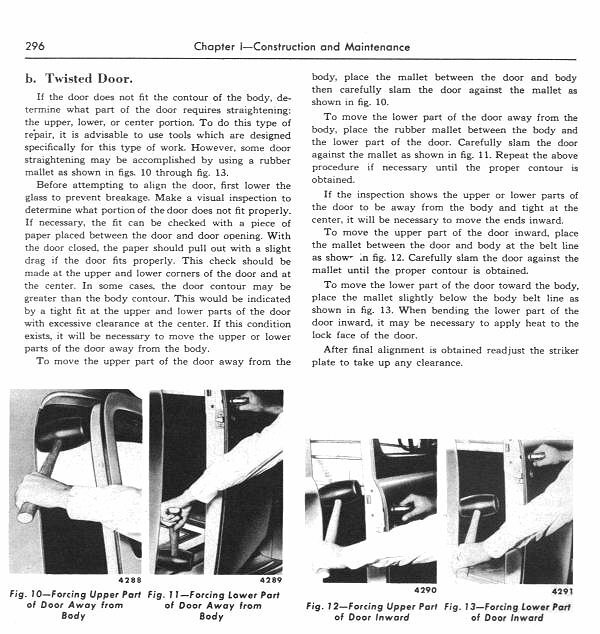 The shop manual says to use fiber blocks to adjust by closing the door with the block in the hinge that needs to move. I read that as being a 2x4. 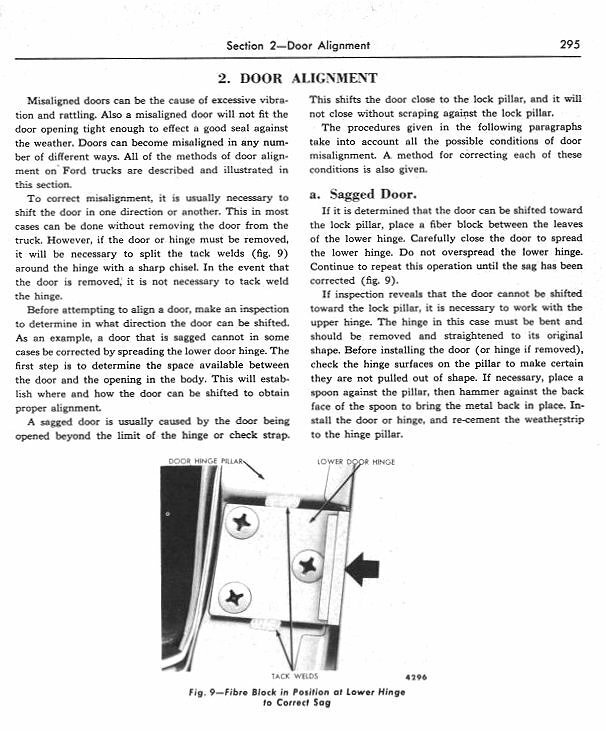 The manual also refers to cutting the tack welds that hold the hinges in place if smaller shims are needed. I know the earlier car/truck manuals specified using a 2x4 and basically forcing things to move as necessary to achieve the results you want. If you want to reduce the gap at the hinge/bottom either spread the hinge at the top to equalize the gap OR carefully use the 2x4 on the latch side of the door at the bottom and press the door toward the hinge. Shims aren't really much of a help when it comes to adjusting these doors. I found the 2X4 way is about the only way. Also, the cab I have on my F-2 is from a very low mileage fire truck, 3000 miles, and the door openings were out of square on both sides. The top front and bottom rear corners had very little gap while the upper rears and lower front were too wide. I used a small port-a-power to push the corners apart and square up the openings. And you thought I was kidding, huh? Truly amazing, the amount of information one can glean from here. excellent info from all of you who helped. BFH wins again!